Valves are clavate, with a broadly rounded to subrostrate headpole. The footpole is narrow and rounded. The axial area is narrow. The central area may be transverse or round and contains a single stigma. The raphe is slightly undulate and lateral. Distinct helictoglossae are present near both apices. The striae are radiate near the central area, becoming nearly parallel near the valve ends. 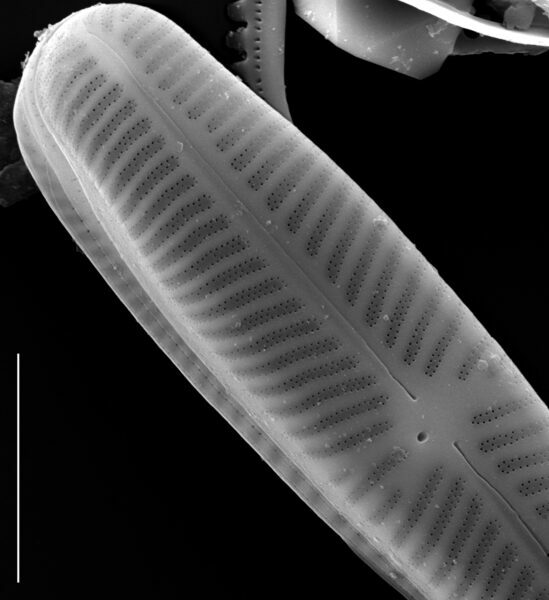 One to two striae distal to the helictoglossae are radiate. Some striae near the central area are irregular and shortened. 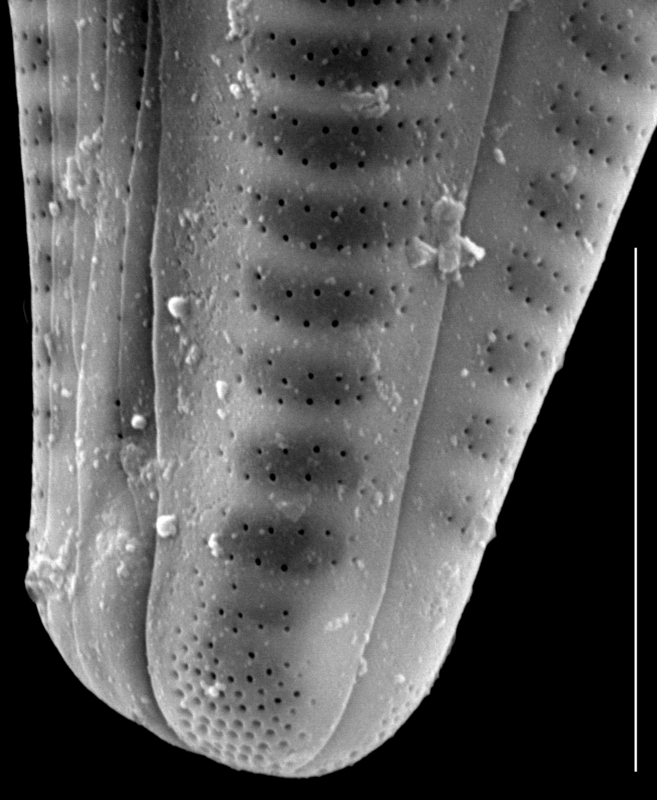 An apical pore field is present at the footpole. 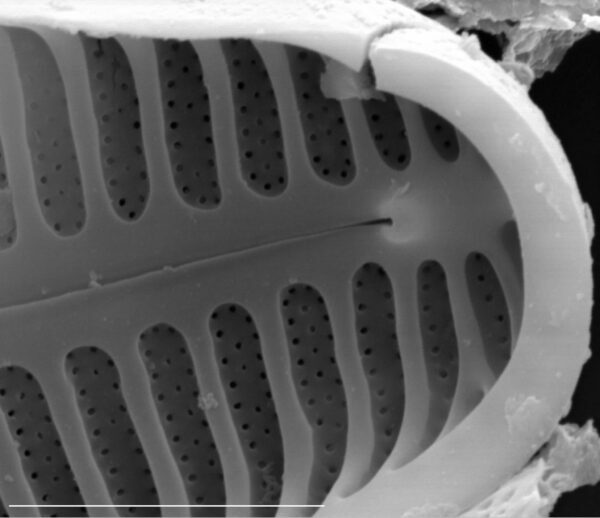 In the SEM, the valve exterior is covered with round areolae, organized into multiseriate striae. The striae are biseriate, to arranged in a quincunx near the axial area. Externally, the proximal raphe ends are straight. At the headpole, the distal raphe fissure is straight; at the footpole, the distal raphe fissure extends over the mantle and bisects the apical pore field. The stigma has a simple, round external opening. 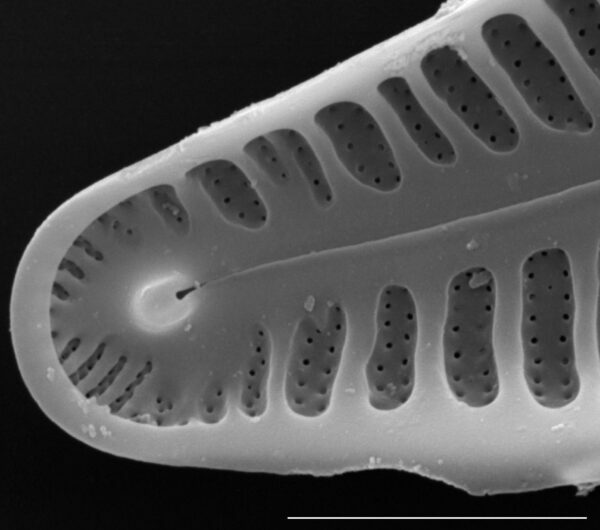 The apical pore field is composed of small, round porelli. Internally, a reduced pseudoseptum is present at the headpole. 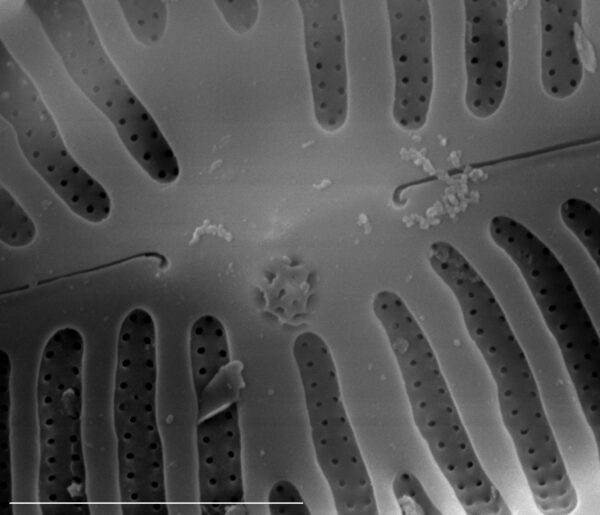 The striae are located in depressed chambers; an axial plate and marginal lamella are both absent. The proximal raphe ends are recurved at the central nodule. The internal expression of the stigma is multichambered. 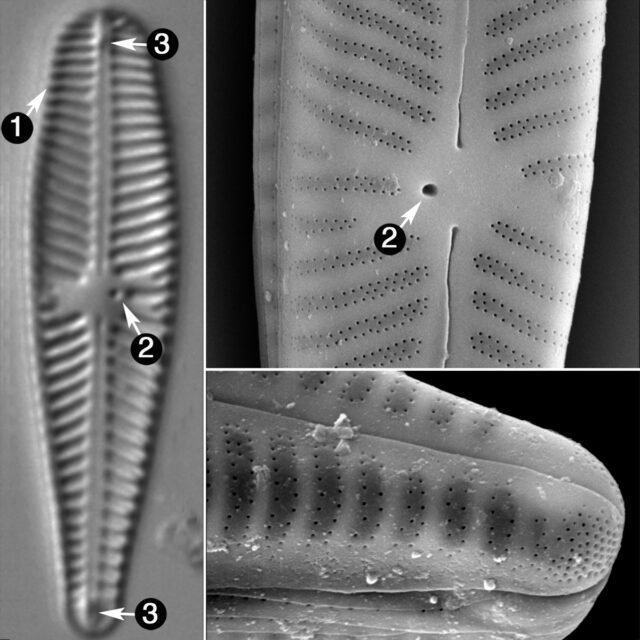 Distally, the raphe terminates at distinct helictoglossae. 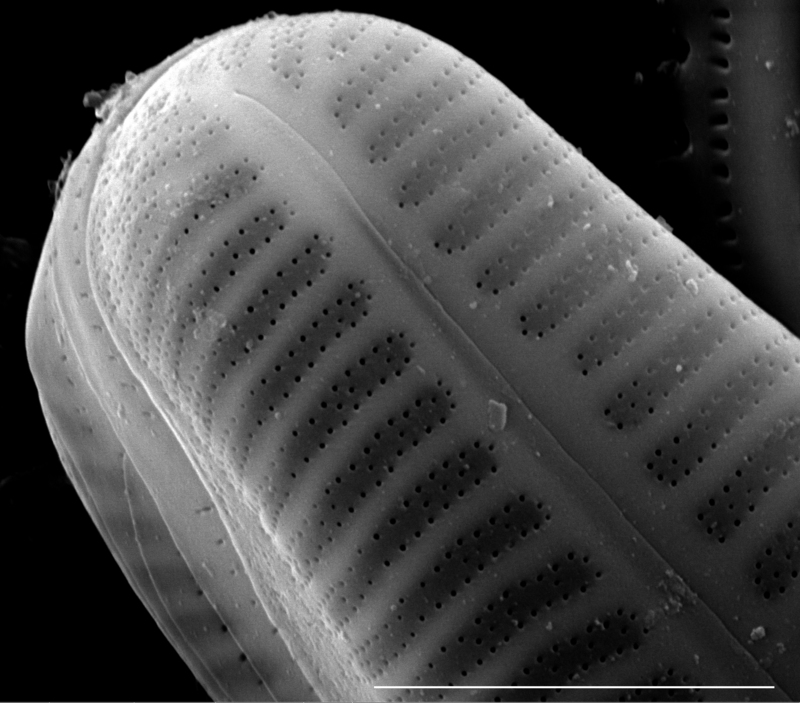 The apical pore field has depressed chambers. The specimens presented here represent the range of one population - large initial valves to valves smallest end of the size range. Cells examined for this study were collected from 17 samples from five sites on Soda Butte Creek, Montana in 1972 and 1973. The stream is high elevation (2290 m.), moderate flow (2.5 cms mean flow), cold (0-10 °C), alkaline (pH 7.5-8.5), soft (26-74 mg/l CaCO3), well oxygenated (8.6-11 mg/l DO), and low to moderate nutrient content (0-0.05 mg/l NO3+NO2 and 0.02-0.06 µm/l PO4). Groundwater running through an abandoned gold and silver mine tailings pile leached reduced (Fe+2) iron into the stream 2.4 km above the sample point. Dilution from a relatively large tributary reduced the concentration of total iron at the sample point to 0.5-5.0 mg/l total Fe. 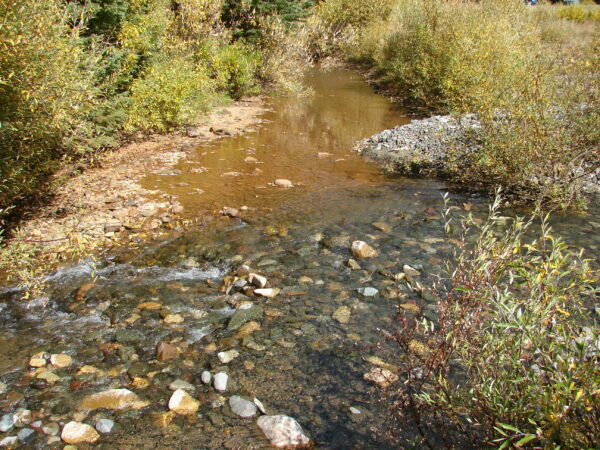 Confluence of Soda Butte Creek and Woody Creek, Montana, where Gomphosinica geitleri grows in high abundance. Image taken August 2011. Valves are lanceolate to linear-lanceolate, with a capitate headpole and narrow footpole. The axial area is narrow, with a straight raphe. The central area is variable, orbicular to rectangular, and has a single isolated punctum. Striae number 13-16 in 10 µm and are radiate at the central area, strongly radiate at the footpole and nearly parallel at the headpole. Length 17-45 µm, breadth 5-8 µm. Valves are clavate. An isolated stigma is present in the central area, at the end of one stria. The helictoglossae are distinct. Striae are biseriate to arranged in a quincunx, although this feature is not discernible in LM.